The incident of a strong underground leader wanted badly by Sri Lanka being arrested at a Dubai hotel yesterday (5) was flashed across news pages with Dubai coming into the limelight and we made an inquiry about it. is of special interest to note that they have reported as a leading news item on their first page. 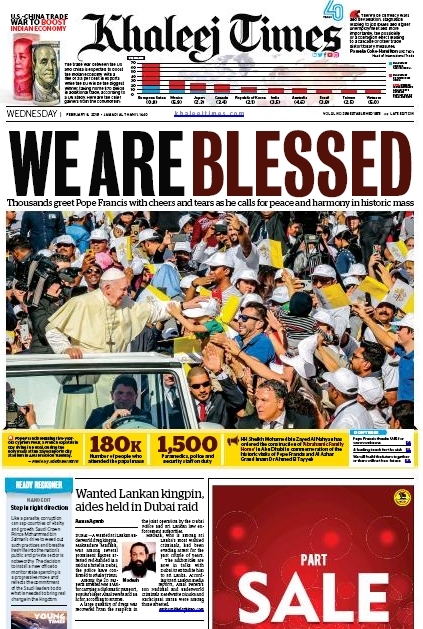 As His Eminence, the Pope is on a tour in that country these days, most of those newspapers have published those photos and attendant descriptions all across their pages. According to what was reported about Makandure Madush and his colleagues being arrested, Kaleej Times newspaper the name of the hotel where they were apprehended was not reported. What the newspaper stated was that the number was 20 and not 25. Kaleej Times also spoke about a person who had a diplomatic passport who was among the arrested. It has been reported that a popular singer of Sri Lanka, Amal Perera and an actor too were among them. 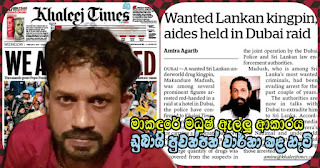 Kaleej Times further has stated that this operations ad recovered a large quantity of narcotics and that it was launched in unison with Sri Lanka Police and Dubai Police combined. It was further mentioned therein that discussions are underway about Madush who was taken into custody being handed over to Sri Lanka.